Oxford made the long trip to the south west and defeated the Cornish Sharks in a potential trap game that could have put an end to Oxford’s winning streak. 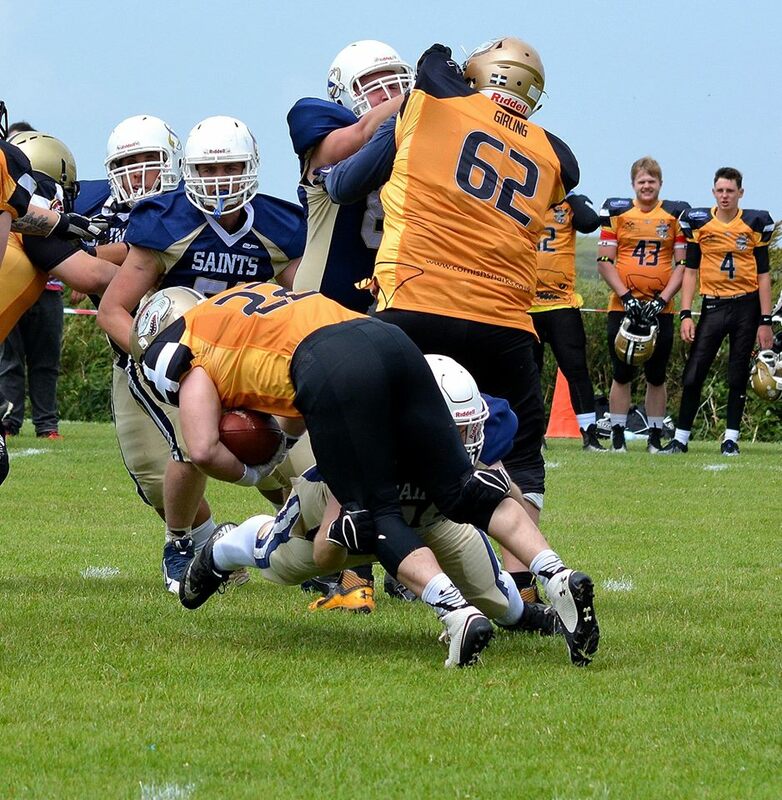 A long rivalry between the Saints and the Newquay team remained feisty as always, with Oxford coming out clear winners in a decisive 2nd half performance. 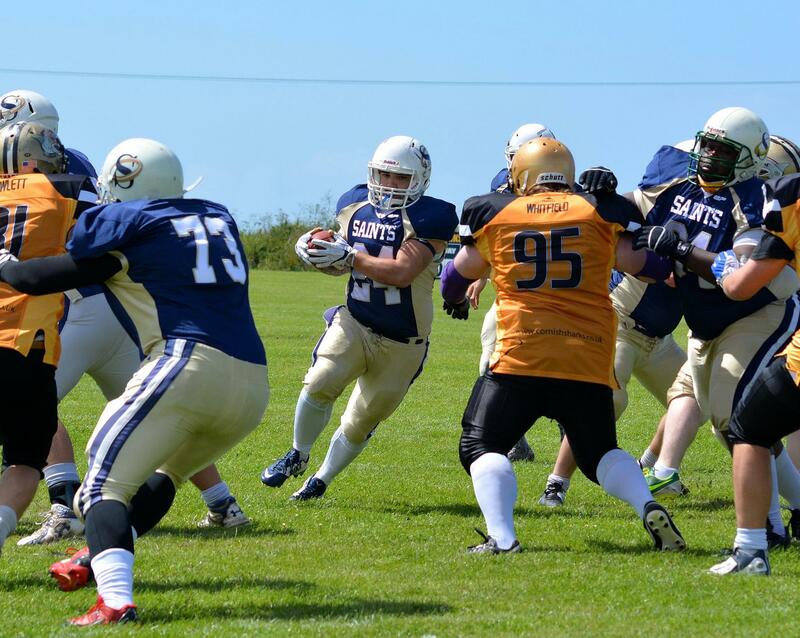 Despite the long distance and the fact that the Sharks are notoriously tougher at home, the Saints squad travelled well with a smaller than usual but still a strong squad of approximately 50 players, outnumbering their opposition (as has become tradition with every game this season). The event was a special occasion for the Sharks who were marking their 100th game, but they were unable to claim the result they wanted. In windy weather, the Sharks offense began with the ball and looked to make a statement with their opening drive. A 14 yard run quickly earned the hosts a 1st down followed by a 17 yard pass for another. Following the two big gains, the Saints defense took control with linebacker Calvin Holmes tackling the ball carrier for no gain. A pass attempt down field was broken up by corner back Mike Turner before Holmes delivered another tackle, denying the Sharks any progress. On 4th down, Sharks kicker David Kriehn got points on the board with a 37 yard field goal going through the middle of the uprights. 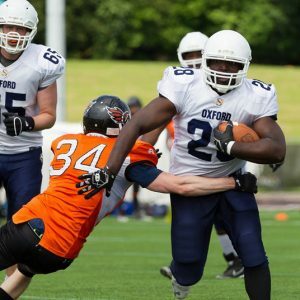 Oxford’s offense took over led by quarterback Destin Maulding, but were unable to get going after incomplete passes intended for favoured options; James Walter and Richard Bloomer. 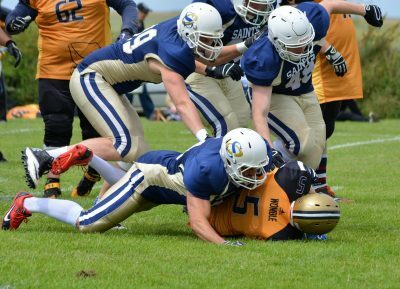 After punting the ball back to the Sharks, the Cornish side were faced with an Oxford defense who had found their rhythm and linebacker Sam Stancombe delivered 3 tackles in 3 plays to prevent a 1st down. On Oxford’s next drive, running back Rob Johnson picked up a 1st down with fellow runner Luke Fry earning another on a 14 yard run. The Saints continued to move the ball well and Maulding completed a 8 yard pass to veteran receiver Sam Armstrong. Despite the performance, the Sharks defense stood firm and stopped running backs Rob Johnson and Kev Brooks from gaining further yards. 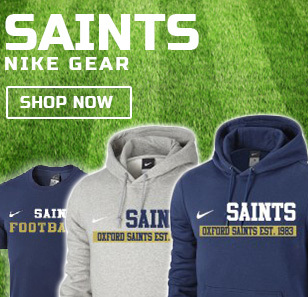 On 4th down, the Saints evened the score with a 25 yard field goal by first year kicker Sam Fielden. 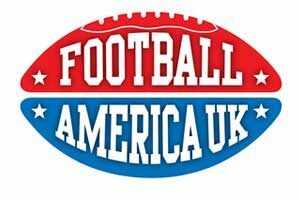 Both teams continued to fight it out on the ground with only a few attempts to move the ball in the air due to the weather. 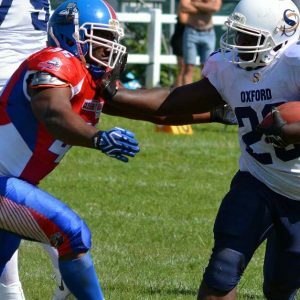 Oxford were able to put together longer and more sustained drives then the Sharks, but were unable to finish them off with touchdowns. In the 2nd quarter, running from Rob Johnson and James Walter moved the Saints across the field. On 3rd down, the Saints executed a pre-designed trick play and claimed a crucial score. Quarterback Destin Maulding completed a short pass in the back field to James Walter and as defenders closed down on him, Walter stepped forward to throw the ball back to Maulding, who was now in stride into open field for a 17 yard completion. Maulding crossed over the goal line and picked up the score. A 2 point conversion attempt was unsuccessful but the Saints took the lead. 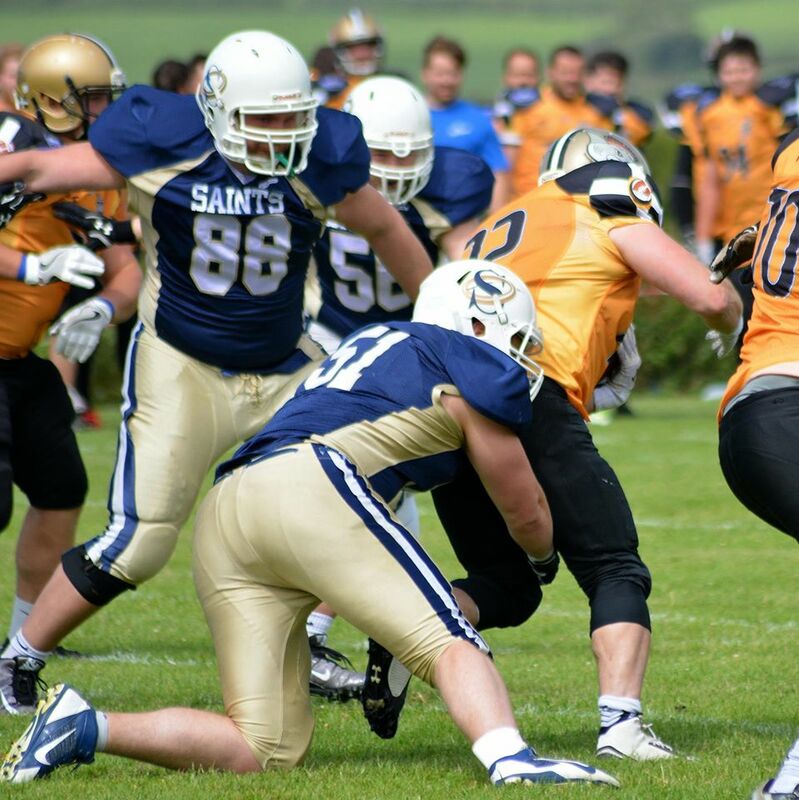 The Saints defense continued to perform well and prevented the Sharks from balancing the scoreboard. A fumbled ball was recovered by Holmes and on their next drive, a series of incomplete passes forced the Sharks to attempt another field goal. 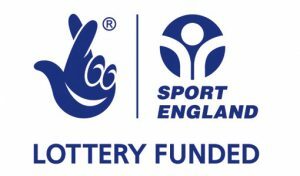 This time from a distance of 48 yards out, David Kriehn was unable to deliver the extra points and missed his target. After the half time break, the Saints began with the ball and Rob Johnson quickly picked up 17 yards and a first down on 3 carries. The multi-purpose James Walter struck hard soon after with a 37 yard touchdown run, capped off by a successful extra point kick from Fielden to open the 2nd half with a decisive score. Fired up by the quick score, the Saints defense continued to be formidable. 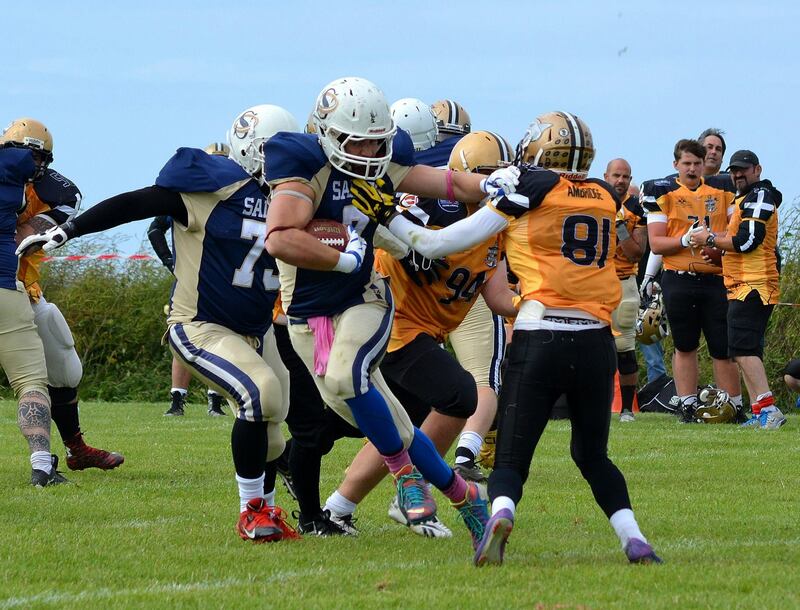 First year player Sion Evans delivered a tackle behind the line on Sharks running back, with their quarterback then throwing 2 incomplete passes, ending the drive with a punt. 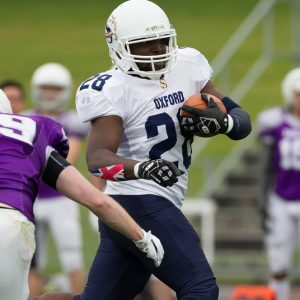 The experience of the Oxford offense proved too much for the faltering Sharks to handle, as Maulding hammered in a pass for 17 yards to Sam Armstrong, followed up by a big 37 yard run from James Walter. On the 1 yard line, Maulding ran the ball in himself on 2nd down and extended the lead. Fielden’s extra point kick was blocked. On defense, Sam Stancombe remained the leading figure with 3 tackles on the Sharks’ runners, 2 of them behind the line forcing a loss of yards. Coming away with minimal progress again, the Sharks were forced to punt the ball back to the Saints. 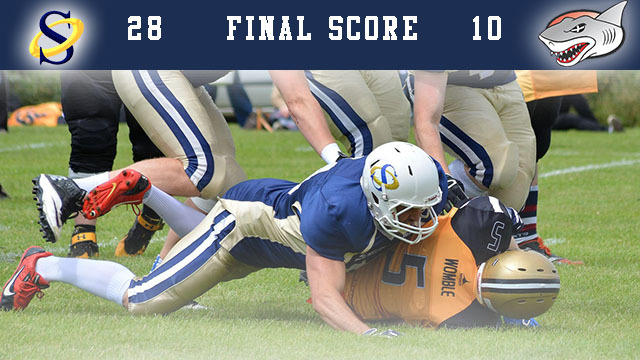 Oxford meanwhile continued to dominate on the ground and quickly added another quick score. The speedy running back Kev Brooks evaded his pursuers and scored on a 57 yard run on the 2nd play of the drive. Fielden was unable to tack on the extra point but the Saints pulled away to a 28-3 lead. 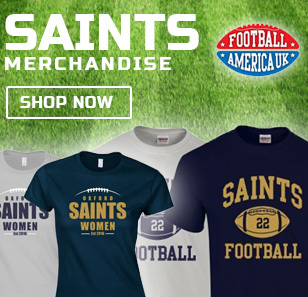 After a heavy-run game from both sides, the Saints were taken aback when the Sharks began moving the ball well in the air on their next drive, picking up several first downs on big pass plays down the field. Despite close coverage by the Oxford defenders who brought down the receivers swiftly after the catch, they were unable to prevent the Sharks quarterback from connecting with his targets. Although a great effort by Holmes to claim a sack for a 17 yard loss on the quarterback, he completed another deep pass on the next play which set up runner Shaun Griffin to score on the ground from 1 yard out. 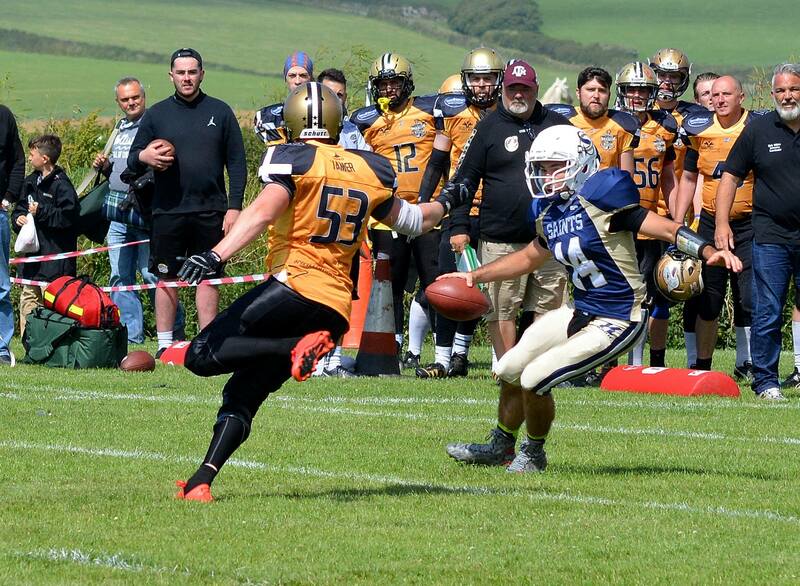 David Kriehn added the extra point and finished the drive which saw the Sharks claim their only touchdown of the day. The remainder of the 4th quarter saw both teams exchanging drives with but with no further scores and the Saints ran out the remainder of the game clock to claim their 7th straight win. With Oxford clearly at the top of the Division II South West conference with a 7-0 record, the Saints have now confirmed their place in the quarter finals with the first round of playoffs scheduled on 21st August. 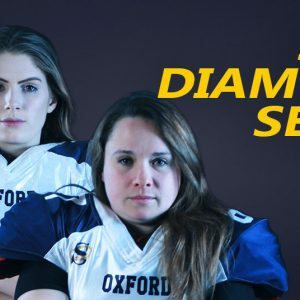 Three more regular season games are coming up, all at home, with Oxford hoping to move into the playoffs with a perfect 10-0 record. On Sunday 17th July, the Saints will host the Torbay Trojans, followed by the Jurassic Coast Raptors on the 31st July and then closing off with nearest rivals the Swindon Storm on 14th August. The Saints have come out clear winners against all three teams earlier in the season, who are struggling to compete against the #1 ranked Saints and the #2 Bristol Apache.